1150 HORNET Plankowners/Crewmembers stand to be recognized. by presenting ceremonial ship's log and glasses. 1210 Lutz orders Chief Signalman to hoist commission pennant. Ships jack is hoisted at same time. 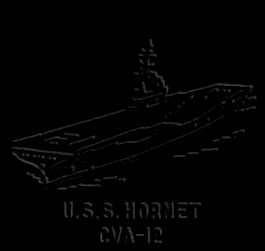 HORNET Volunteers to man the ship. organ. The last verse follows with the full band. Who bidd'st the mighty ocean deep.